Happy Friday to all our loyal NumberCruncher blog followers! I hope everyone's week is wrapping up nicely after Scaling New Heights. And most importantly, I hope your looking forward to this extended 3 day weekend! With the hustle and bustle of this busy holiday weekend involving travel, families and cocktails; your businesses could be last furthest thing on your mind, especially your inventory levels. Before you leave your office today, make sure your All Orders software is incorporated with ReorderPoint.com, that way you don't have to stress out on Sunday night, if you are unsure if you need to push an order through for Tuesday morning delivery. Just like always, if you need any type of help or have any questions about All Orders or ReorderPoint.com, please visit our support page or give us a call at 866-278-6243 so that we can set you and your company up for a training session! As a reminder, every year when you renew your All Orders plan, your included training hours reset, this allows us to ensure that our clients always stay up-to-date on the latest and greatest features NumberCruncher is bringing you. If you have recently renewed, please give us a call to set up your training refresher TODAY! During the beginning part of this week, NumberCruncher CEO, Ian Benoliel, was chillin' out maxin' relaxin' all cool, at Woodard's yearly conference Scaling New Heights. This years conference was held at Paradise Island in the Bahamas, and by all accounts it was a great few days. All the Tracks and Sessions were thoroughly thought out and planned with the attendees in mind. Scaling New Heights left the NumberCruncher team eagerly awaiting next years conference. It was announced that the Scaling New Heights 2017 conference will be held in our own "backyard" at Disney's Coronado Springs Resort! Make sure you register now because you never know what the NumberCruncher team might have up our sleeves! While Scaling New Heights was going on, NumberCruncher's product ReorderPoint.com was selected by the leading QuickBooks blog, Insightful Accountant as their "Warehouse Wednesday Review" product of the week! The feature was written by the Senior Editor, William Murphy. If you and your company are still on the fence about adding ReorderPoint.com to your All Orders software, please take the time to read the review and learn all about the benefits of adding this program! As mentioned in last weeks post, the NumberCruncher blog will be going through some changes over the next few weeks. These changes are going to allow us to communicate with our readers/followers better, as well as, allow us to incorporate some new and exciting features. As we start implementing these new changes and added features, we're going to be reaching out to our loyal customers, followers & readers to find out what they would like to see in the NumberCruncher weekly blog. Please feel free to leave a comment below with what you will enjoy reading about or if you would rather email me your comments, jgoldberg@numbercruncher.com. Hope everyone has a healthy and enjoyable Memorial Day Weekend! Hey everyone. Welcome back to another weekly edition of the NumberCruncher blog! As our weekly readers know, our trainer/support tech, Tom, has been writing our weekly blogs for the past few months. But as summer starts to ramp up and Tom's calendar starts to fill with training appointments, I've been asked to take over. My name is Josh Goldberg, and i'm the marketing supervisor here at NumberCruncher. For the fans and loyal readers of our blog posts, please don't panic! Our blog's will continue to include support answers and how to's, for our product's including All Orders. But it will also include other exciting technology news and new features will be popping up all the time, so make sure you subscribe and follow the NumberCruncher blog, because you never know what will appear! As always, if you are struggling or have any questions about All Order's software, please visit our support page or give us a call at 866-278-6243 so that we can set you and your company up for a training session Today! Today's blog post will focus on our product line. Kind of a reintroduction of who we are and what we offer. Before we can dive into our award winning products, we need to start with who we are. NumberCruncher, Inc is a leading provider of inventory and order management software for the QuickBooks community. Founded in 1999, NumberCruncher was the first developer to invest in QuickBooks software development kit from Intuit. Our mission has always been to provide innovative, scalable and cost effective inventory management solutions that solve real world business issues, resulting in total customer satisfaction, increased profitability and competitive advantage. Thousands of manufacturers and wholesale distributors rely on NumberCruncher solutions to manage their everyday business activities across the globe. From inventory control to production management to order processing and fulfillment, these solutions are unmatched in the marketplace, setting the standard for QuickBooks inventory add-ons for the manufacturing and wholesale distribution markets. Our flagship product All Orders, is inventory software that bridges the gap between business accounting and business success. All Orders is a comprehensive inventory and order management software application that helps you make better business decisions in purchasing, shipping and receiving, order entry, production and inventory control. All Orders gives the business owner, manager and accountant the tools to be successful faster, easier and more efficiently. The best part about All Orders is the fact the application can be used as a stand-alone inventory software, or users can fully integrate it with QuickBooks, so you never have to enter the same data twice. Besides the integration with QuickBooks, All Orders also supports integration with 3D Cart, Magento, Sales Force, UPS, FedEx & USPS; just to name a few. If you are already an All Orders user, please make sure you have upgraded your software to the latest version 6.2.3, which was released in March. To verify your currently version, please go to Help --> About. The new update was for general maintenance purposes and includes all previous updates and addresses known issues. After the success of All Orders, NumberCruncher got back to the drawing board and realized that in today's society, there's a growing trend of business owners who are constantly on the go and spend very little time, in their main offices. These owners were the inspiration behind our products All Orders Mobile & All Orders Web. All Orders Mobile extends your company's inventory management by bringing it into your warehouse and allows you to take full advantage of the barcode label printing feature within All Orders. The goal of All Orders Mobile is to make your warehouse operations more efficient. After All Orders Mobile is installed on your Windows based device, it connects wirelessly to your All Orders database and download sales orders to be picked, purchase orders to be received and counted. Once a sales order is picked, the picking information will be uploaded in real time back to the All Orders database and automatically creates a Ship Doc. Similarly, once a purchase order is received through All Orders Mobile, the information will be uploaded to All Orders and a receiver will automatically be created. Finally, All Orders Mobile will update your count in All Orders with the new quantities. All Orders Web is an e-commerce website that shares a database with your All Orders program. All items, customers, vendors, purchase orders, quotes and orders that are created within All Orders will be instantly available within All Orders Web portal and vice versa. One of the unique features of All Orders Web, is the ability to give role based access to your staff, sales reps, customers and vendors. The role based access feature, will significantly improve customer engagement and quality of service by allowing your customers to view stock availability, create quotes & orders, as well as, check on order statuses. Another beneficial feature of All Orders Web to businesses, is the fact the program is written using ASP.NET, so all the web forms are customizable. You are not only able to customize the look and feel, but you are also able to customize the "business rules" that are specific to your industry. Finally, our newest product, ReorderPoint.com, might be the one to impact the industry the most. ReorderPoint.com is a purchasing tool that offers a systematic approach to forecasting inventory needs. ReorderPoint.com is a cloud-based application that integrates with All Orders and QuickBooks. The way it works is, during the initial setup, ReorderPoint.com, will import up to 3 years of historical data from your QuickBooks/All Orders files including sales figures, purchases and component usage. The program then uses statistical methods to determine lead times, trends, seasonality and special orders. Based on the type of trends we identify we apply a model (i.e. a mathematical equation to calculate lead time demand). 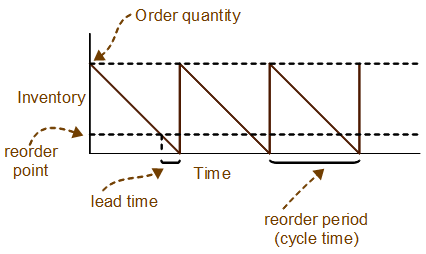 We then use the lead time demand to calculate the reorder point. The program also regularly imports your current inventory status including on hand, on purchase orders and back order quantities. ReorderPoint.com then compares the inventory status to the reorder point and sends alerts when the status is below of nearing the reorder point. Additionally, ReorderPoint.com provides lists, reports and graphs you can use to analyze your usage and make more informed purchasing decisions. Being involved in the software industry means your work is never finished. The minute you take a day off, everything switches up on you. We at NumberCruncher are always participating in new training exercises and growing our knowledge of QuickBooks & technology in general. Woodard is a company that empowers small business advisors through cutting-edge training, networking, coaching & resources. Next week Woodard is hosting their annual Scaling New Heights conference. This year's conference will run May 22nd through May 25th and be located at the Atlantis Resort in Paradise Island, Bahamas. If you will be attending Scaling New Heights, please make sure you stop by the NumberCruncher table at booth #96 and tell our CEO, Ian Benoliel that Josh sent you! Hello everyone. Welcome back to the NumberCruncher Blog. As most of you know, My name is Tom and I am the trainer/support tech here at NumberCruncher. If you need to learn how to do something in the All Order's software, I'm your guy! Remember, if you are struggling with something in the All Order's software, please give us a call @ 866-278-6243. We can set up a training session with you and your company remotely. So make sure you build up those questions and give us a call to set up your session today! That's not what brings me to the blog today. What I would like to talk about today is something that customers ask about all the time, "How do I include employee Costs in BOM's." So sit back and enjoy the read! Our first step is to create an item that we can put into a BOM. We're going to create a new item called "Labor" (or whatever you would like). This item should either be a non-inventory part, service or other charge group. If you are creating this item in QuickBooks, check the "This service is performed by a Sub-contractor, owner or partner." Next, go to the purchasing tab, enter the cost. The cost should estimate the hourly wages and benefits. Of course, we're going to need to select an income account and an expense account. For income, you can select any of them. For the expense account, create a new account Called "Salaries Applies to Finished Goods". Save and close this item. Now it is time to include this newly created item in the appropriate Bill of Materials. Go to a finished good item and edit the BOM's. Simply add this item to the component lists. Save and close. Now we can start using this finished good on a work order that will include this new Labor Item's cost. When you finish a production, the labor cost will be deducted from Salaries Applied to Finished Goods expense and included in the cost of your finished product. Now if the salaries account is greater than the Salaries Applied to Finished Goods, this means that a) you have processed payroll but have not yet finished the product or b) the Cost amount on the item is too low. If the Salaries account is less than the Salaries Applied to Finished Goods this means that either a) you have finished product but have not yet processed payroll or b) the "Cost" amount on the item is too high. Well, I hope this has cleared any confusion you might have with creating Employee Costs in BOM's. If you still have some question's, place a comment below, and I will answer your question directly. You can also send us an email Support. It's Friday! Take some time to yourself this weekend and get ready for Monday! Enjoy! How to add users in All Orders! The Manage Users command, available from the Company menu, allows you to set access levels for every individual in your organization who will be accessing the All Orders system, including sales, administration, production teams, etc. This must be done separately within All Orders, as the application does not make use of QuickBooks user profiles. By default, only the Admin account exists. This account does not initially have a password. If you're going to be setting up a multi-user environment, then this is the first thing you'll want to remedy. Administrators have complete access to the program and its data, and only administrators can view, add, edit, or delete users and user rights. As such, this account needs to be well-protected with a strong password. Type a password into the Password field, and then retype it in the Confirm Password field. Once you've protected your Admin account, it's time to add other users. Choose Save & New from the Save drop-down list button. You'll then be required to choose a User Name and Password as well as set access privileges. After entering the unique user name and password, click the Access Levels tab. No Access. User cannot edit or even read the list. Read-Only Access. User can access the data, but cannot make edits. Full-Access. User can access the data and has full write privileges for making edits. This user is connected to QuickBooks option appropriately. Unchecking this option disables synchronization with QuickBooks. See Synchronizing with QuickBooks on different strategies for QuickBooks exchanging information with QuickBooks. 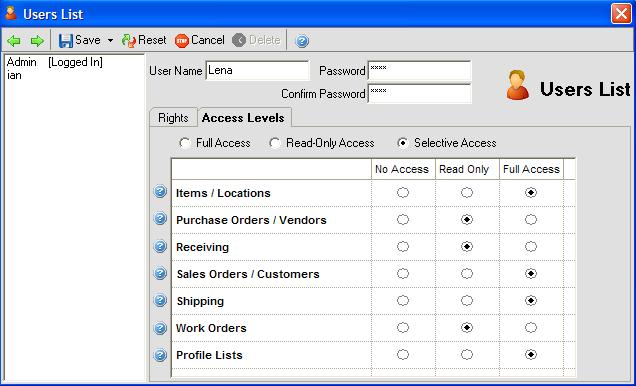 There are numerous check boxes that can be used to grant/restrict access to the user in question, such as the ability to delete records or approve Sales Orders. Check all the boxes that apply. In addition to these check boxes, All Orders also sports two special filters: by Sales Rep, and by Location. For example, if you want to restrict an employee's data access to a customers having a particular sales rep. Choose either Save & Close to save your work and exit the dialog, or Save & New to save the current user and move on to the next one. Well that is all for today! I hope everyone has a great weekend! Make sure to contact us if you have and Questions. support@numbercruncher.com or call us @ 866-278-6243. Welcome back to the NumberCruncher blog! I hope everyone is have a great week! Today I would like to talk about an add on to the All Order's software called All Order Mobile. All Order's mobile extends inventory management into your warehouse. This will allow you to increase your efficiency in the warehouse by decreasing mistakes made. All Orders Mobile by NumberCruncher extends inventory management into your warehouse and lets you take full advantage of barcode label printing within All Orders. To me, this add on really makes our inventory system the best inventory software on the market. Just a little bit of background on myself. I use to manage a warehouse. When I was in that field, we didn't have any bar code scanning or a real time inventory management system like All Orders. Which made my job much more difficult. Adding bar coding to your company will save a lot of headaches going forward. Imagine doing your inventory count's on a hand held device, scanning instead of physically counting. I would of gave anything for this system! Now let's talk about All Orders Mobile. All Orders Mobile by NumberCruncher will make your warehouse operations more efficient! All Orders Mobile is installed on Windows based devices. It can connect wirelessly to your All Orders database and download sales orders to be picked, purchase orders to be received and counts. Once a sales order is picked the picking information will be uploaded in real time back to the All Orders database an automatically create a Ship Doc. Similarly, once a purchase order is received through All Orders Mobile, the information will be uploaded to All Orders and a Reciever will automatically be created. Finally, All Orders Mobile will update your count in All Orders with new quantities. Check out our Intro video on All Orders Mobile by clicking here. We also have more video tutorial's showing how to perform a Sales Order, Receiving a Purchase Order and performing an inventory count. How to return Item's from the Consignment. Hello, and welcome back to the NumberCruncher Blog! Hope all of you are doing well and you business is thriving! Today I would like to continue to talk about a feature in All Order's called Consignments. I left you guy's hanging last week and only show you how to ship those item's to the customer from the consignment. Today, I am going to tell you how to get some of those item's that didn't sell back in stock from the consignment screen. So you have sent out those item's now it's time to get some of those back. You will want to create a brand new consignment. Enter the same customer you shipped those item's to. Before I had you enter in the QTY you wanted to ship to the customer in the Ship Doc column. This time you will update the QTY you would like to receive back into All Order's. You can do that by entering the QTY into the Return Column. Once you have entered the necessary qty to be returned, go ahead and go to Activities - Finalize. This will create received doc's for those item's. This process is very similar to what we did last week. Well, that is all for today. I hope you guy's have a great week! Remember if you have any questions, head over to our website. As always you can always e-mail customer support at support@numbercruncher.com or call us (866) 278-6243. What is a Consignment? How do I ship out item's? Hello, and welcome back to the NumberCruncher Blog! Hope all of you are doing well and you business is thriving! Today I would like to talk about a feature in All Order's called Consignments. You might be asking yourself "What is a Consignment?" Consignment is the act of consigning, the act of giving over to another person or agent's charge, custody or care any material or goods but retaining legal ownership until the material or goods are sold. We have a perfect feature in our system for this. To start a new consignment, go to Sales - New Consignment. But lets not get ahead of ourselves. Before we get that started, you will want to make sure you set up the default location for the specific customer. You can do that by going to the customer screen, clicking the Shipping Info tab, and selecting that default location. You will want to make sure you set that location to the location where your quantity is. The reason why you have to set that up before is because only those customers with the default location set will appear in the drop down. Ok, back to the consignment. Once you add a customer and a location, all the items in that location will populate. You can use the filter tab to filter for a specific item on the list. This is where you will be able to pick and choose what item to send and how much QTY to send. You will enter this info under the ship doc column. Once you have selected that information, we can go ahead and go to Activities - Finalize. Now a Ship Doc will be created for that customer for those items. Next week, I will talk about how to get those item's that didn't sell back from that customer. Stay tuned!